Eat these 5 superfoods. Don’t eat these 7 foods if you’re trying to lose weight. 10 foods that boost your fat loss. The hidden dangers of the food you love. Saturated fat is bad, no saturated fat is good, eat more butter. Dairy is bad and only for babies; no, dairy is good, drink your milk. Wheat is bad and causes inflammation, no wheat is important, eat your whole grains. And so on and so on until your head is spinning. What should I eat, what shouldn’t I eat? Today’s media, certain doctors and certain nutritionists give conflicting information on an almost daily basis. One day you pull up your news feed on your computer and one thing is said, then less than 24 hours later, someone posts something contradictory. Being an average consumer, just trying to go to the grocery store/market and buy healthy food for your family is quite tough today. Being an athlete and trying to fuel your body to perform it’s best is tough today. I’m not talking about the cost of food, but the conflicting messages that are everywhere. So, while I don’t have the answers for everyone, and everyone needs to eat what is best for their body, here is my take on what the average person/athlete should consume on a daily and weekly basis, plus do’s, don’ts and tips. Whole grains(amounts vary on your training period): 100% whole wheat, Sprouted and/or gluten free if you’d like, oatmeal, ancient grains: amaranth, spelt, millet, etc. Coffee: no recommended amount, but I’m adding this for my coffee loving friends/athletes. Vary your amounts depending on your training period, because if you can taper off coffee/caffeine before a big race, there’s a potential for feeling a greater effect from caffeine during the race. Butter: please choose a healthy oil like olive or coconut first, but butter is fine in moderation. 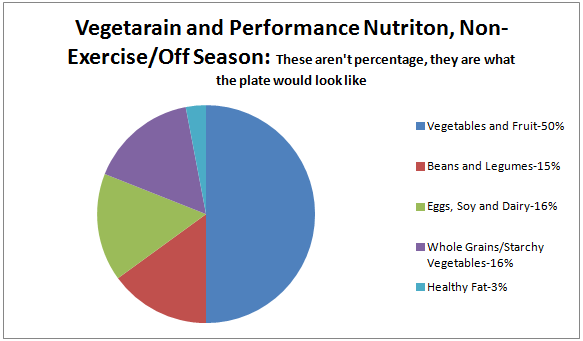 Nutrition Plates: What should your plate look like? Periodize your nutrition to match your training levels. When you’re in a build, or the heart of your training, focus on including more starchy carbohydrates into your daily nutrition. When you’re out of season, you need less emphasis on starchy carbohydrates and more emphasis on non starchy carbohydrates. Oats, pasta, quinoa, sweet potatoes vs. Leafy greens, peppers, cruciferous vegetables. One serving of meat: the palm of your hand. For women this can be around 3-5oz, men usually 5-6oz. One serving of grains: your hand in a fist, or your hand cupped and turned upwards. This is about 1/2c-3/4 cup cooked grains depending on men vs women. One medium potato: the size of a computer mouse. Do eat real food. Shop on the outside perimeter of the grocery store, and utilize your local farms and farmers markets. Cut down on packaged and processed foods. Don’t just eat less food, eat foods that give you more satiety value, so you end up eating less i.e. 150kcal of sliced red pepper with hummus vs 150kcal of crackers-the pepper and hummus=vitamin, minerals, fiber, antioxidants, healthy carbs and fat, while the crackers are processed, and may contain carbs, but possibly refined grains, sugar and fat. Don’t be afraid of fat, fat is not your enemy: nuts, olive oil, avocado -high fat foods contain high amounts nutrients, but also a high amount of calories. Watch your portions. Don’t consume your calories in juice or liquid form-eliminate juice, sodas, sweetened teas and choose coffee, tea, water and milk. An exception to juice is for athletes prior to a morning workout who can’t stomach solid foods. Make it 100% juice though. Do consume fish several times a week. Look for wild caught fish, and surprisingly, canned tuna and salmon are good and inexpensive choices as well. Good choices: Salmon, tuna, tilapia, cod, oysters, shrimp and trout. Ketosis and high fat diets can work for sedentary people, people trying a treatment for a certain disorder/disease, and for athletes going long, who don’t need to be able to kick it into high gear. If you are an athlete who wants to be able to “kick it into high gear” consume at least 150g carb/day. Low fat and fat free foods often have added sugar to make them taste better. Watch out for foods that say “low fat” or “diet.” The exception for these is skim milk, and 1-2% yogurts and cottage cheese. If you get fat free, you’ll often see added sugar. Ex. Fat free cottage cheese might contain added sugar because they took out the fat : 1-2% cottage cheese will usually not contain added sugar. Always check the labels. Make meat the side dish, and highlight vegetables during a meal. 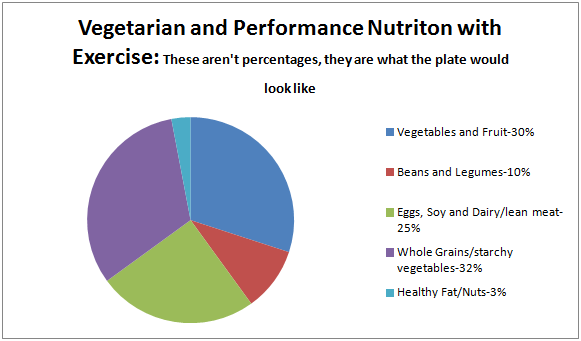 Try to increase your amounts of vegetables and only include meat on an occasional basis. Dairy protein/Whey is the best protein source for athletes due to it’s high amounts of leucine. If you’re not lactose intolerant, dairy is a fine choice for most people. There is conflicting evidence with cancer. Some studies show an increased rate of cancer while others show a decreased rate of cancer after consuming milk. If you can afford organic, that’s great. If you can’t, it’s still a good choice. If you’re worried about dairy, you don’t have to consume it. It’s as simple as that. You then need to get your protein, leucine and calcium needs from other sources. Protein helps you to stay full longer, so try to have at least 20g of protein at every snack or meal. Sugar, the most talked about nutrition word of 2014. That might be an exaggeration, but it is currently a hot topic. As athletes and non athletes, our body uses sugar/glycogen as fuel. So, on a whole, sugar isn’t bad, we need it. If we break it down, we should get our sugar from fruits, vegetables, beans, grains, legumes and dairy. This sugar is naturally occurring. The sugar we don’t want in our daily diets is added sugar. This is often in processed and packaged foods. When training, sugar is your friend. One of my sayings is “eat the exact opposite way during training/racing that you do during your normal day.” Avoid added sugar during the day, and when you need to take in sports nutrition (90+min workouts), it’s ok.
Gluten/Wheat is another hot topic. Celiac’s disease, and wheat allergies are real. I also believe that there are some people who are intolerant to gluten. I believe the vast majority of people who think they are intolerant, aren’t truly. If you do believe you are, please still include gluten free grains in your diet: oats, quinoa, brown rice, millet, amaranth, etc. If you are just worried about it, not sure what the hype is, but believe you should avoid it, you probably shouldn’t. On occasion, it’s ok to fall off the wagon, and shouldn’t be cause for any negative feelings. Healthy food is delicious, but sometimes you just need to indulge. That’s totally fine, indulge and enjoy one of life’s finer things. Indulging with good food is truly wonderful, just make it a rare or occasional event. Supplements fall into the ok and waste of money categories. If you’re eating a balanced diet (vegans are not included here as they need more than the typical person), you rarely need to take a vitamin supplement. My exception to that is Vitamin D. I’d recommend all athletes take a Vitamin D supplement, in addition to fish oil. If you want to take a multivitamin, I’m fine with that, it’s like extra insurance. You might have expensive pee, but you know you’re covered. If your doctor has you on something else, like iron, or magnesium, of course stick with what they are having you take. Other supplements are more in the grey area. There is some research that shows positive results from creatine, beta alanine, sodium bicarb, and a few others. Possibly a waste of money, possibly not. Then there are the others that have far reaching claims, those are probably a waste of money.